What has been your favorite part of working in a small team at Blizzard? There are so many things that have been amazing about working on the Hearthstone team, it's hard to choose just one. I love the fact that the team is close. We often eat lunch as a group, for example. It's also amazing that the entire team is in earshot so that when Ben Brode and I start a discussion about design everyone else on the team can hear and pitch in. I love that everyone gets to be a little bit involved in everything, and it is hard to find a part of the game that doesn't contain multiple ideas that came from multiple people around the team. What are you going to do to celebrate the launch? We had a lot of people bring donuts! We have been in a mixed mode today between playing the game a bit more and at the same time working through little issues that have cropped up with the release. The formal celebration will happen sometime next month with a toast and raising of a Hearthstone flag here at Blizzard. One of the things we are looking forward to most as a team is for things to slow down a bit post launch so people can drop out of crunch mode and spend a bit more time with their loved ones. What is it like working on a game that's in beta for so long? I guess it is all relative, but for me this didn't seem like all that long of a beta, since my last beta was for World of Warcraft, when the beta lasted a full year (if I am remembering right). It's been great, since there has been tons of great feedback coming from the community and we have actually had time to incorporate tons of the balance and general feedback we have gotten to make the game better. Of course it also means that people who started the beta in the beginning are eager for more content, but never fear, as we're already looking toward the future! How do you know that a card is too powerful/weak and it's time for a nerf/buff? Is it mostly a matter of frequency, win rates, or something else entirely? It's a mix of things that determine whether we should change a card; it depends on a lot of factors. In some cases the change has nothing to do with balance and has more to do with what is fun (or not fun) to play against. We have in the past nerfed Mind Control, all of the mage Freeze AOE cards, and Pyroblast because they created game environments that were not fun to play against. More recently we changed Nat Pagle because we don't want to have neutral cards that create so much card draw that most players are playing it, and because it has a strong random element to it to boot. We changed Tinkmaster Overspark because it was making players less interested in running the big fun cards like Tirion or Ragnaros or other cards when Tink was just going to remove them. With every card we change, we look at the win rates for that card as well as the anecdotal feedback we get from the community and other people at Blizzard, and then we decide if the time is right. Our plans going forward are to continue to change very few cards and with any luck we will change none at all, but mostly we are going to do what is right for the game. In your opinion, which card or cards have most pushed the limits of raw power? Let's ignore utility here (Novice Engineer) and just focus on sheer Ragnaros-like power. The great thing about Hearthstone today is that even the cards that are the most powerful still have their drawbacks, and so there are still debates about the power cards. There certainly is a leaning toward cards that have an effect before your opponent can do anything, like Ragnaros or Ysera, and so the community might call out a card like that. On the other hand there are cards like Al'akir that are often pointed out as a weak card, but you will see him played in a lot of high-level decks, so perhaps there is some value there that is not yet widely perceived. 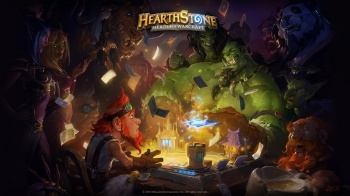 What's next - how do you plan to support Hearthstone after launch? We are already working on the first adventure, and we should be able to talk about it before too long. I can say that we as a team are really excited to start working on many of the great features that will really start to expand the game and broaden the Hearthstone experience.